Sound like you? Many farm folks work hard at producing great crops and caring for livestock, but when it comes to communicating their deepest desires for the future of the farm, they get stuck. You are holding in your hands a useful toolbox created by a farm woman, partner, and mother to a successor. 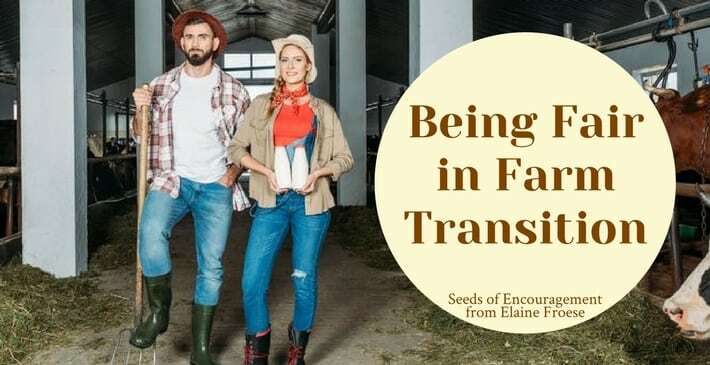 Elaine Froese is a certified farm family coach, mediator, and farm advisor who empowers family to increase profit by having regular constructive communication to secure the legacy of their farms. She can keep each age and stage of all the players clear about their roles and expectations to work out an actionable plan. Elaine Froese has been through two farm transition plans with her family of origin, her in-laws, and now her son and daughter in-law. Share this book with your farm team to have better communication, improved conflict resolution, and solutions for the continuance of your farm business. 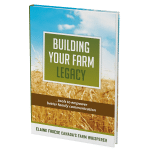 Use the book to plant seeds of new ideas to embrace habits for better relationships and ultimately build the legacy of your farm. Don’t delay. Say goodbye to procrastination. Embrace the tools in this book and enjoy a great culture of collaboration on your farm.